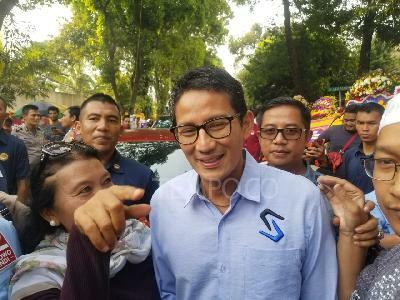 TEMPO.CO, Jakarta - Vice president candidate Sandiaga Uno admitted that he had bought into Ratna Sarumpaet`s lie about being attacked and assaulted. According to Sandiaga, his running mate Prabowo Subianto and his camp also believed the lie to be true. "Mr. Prabowo, his friends, and myself were carried away by the lie," he said here on Thursday, Oct. 4. Ratna claimed that she was assaulted on Sep. 21 in Bandung. Her story went viral after photos of her swollen and bruised face were posted to the internet. Prabowo, Sandiaga, as well as a number of politicians, helped spread the assault story. But the police revealed that Ratna was not in Bandung during the date she claimed to have been assaulted. What the police have proof of is Ratna Sarumpaet was at the Bina Estetica Surgical Hospital from Sep. 21-24, where she got cosmetics procedures done to her face. Sandiaga said he bought into Ratna's lie because he sees the activist as a mother figure. "I imagined what it would be like if it happened to my mother, and so I lost my objectivity and did not think to verify her stories first," he said. He added that his campaign team made a mistake when believing in the lie and that they would learn from it. "Losing in business, to fail early, is good. 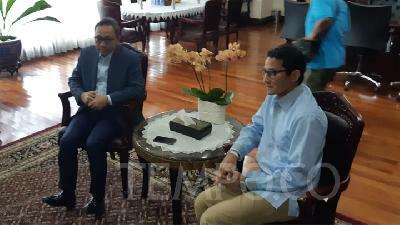 Because we learn from mistakes," Sandiaga Uno remarked.